EMF/RF | Electrosmog Busters – "Who you gonna call?" A recent report in Powerwatch News cautions that induction cookers may release high levels of EMFs, and that children, pregnant woman, and those hoping to become pregnant should stay out of the kitchen when such heating surfaces are in use. Read the Powerwatch News article here. If even mainstream organizations and researchers are admitting that cell phones pose serious health risks, isn’t it time we listened? That is the title of the article at express.co.uk – The Daily Express, a newspaper/Website out of London, England. It’s great to see that the world is waking up to the dangers of cell phones – especially for the young, and that new information is coming to light. But, maybe the information has been there all along, but hidden away? Hmmm…? Read the Express article here: http://www.express.co.uk/features/view/315856/Is-your-child-s-mobile-giving-them-cancer-Is%20your%20child%E2%80%99s%20mobile%20giving%20them%20cancer? Found this picture online, and not sure of the author. But, it’s message is clear. Image is copyright of the owner. 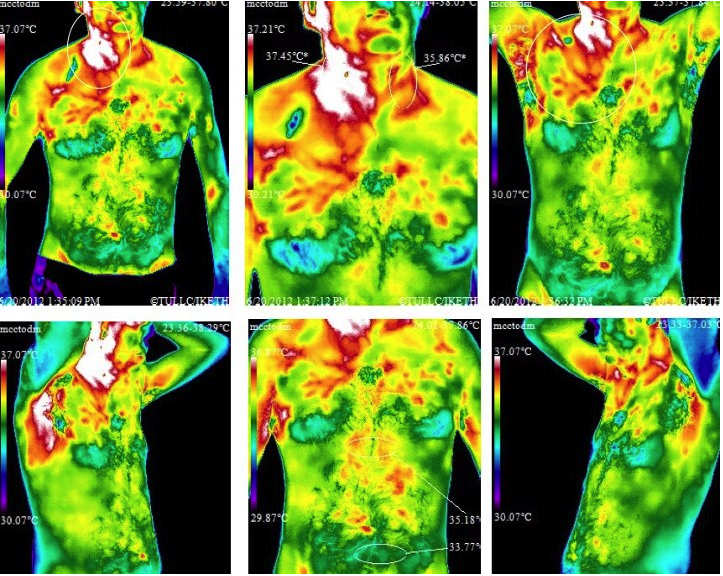 These thermographs show the effect of cell phone radiation on the human body. The white areas indicate dengeneration and the red areas indicate inflammation, caused by cellular phone radiation. They already use them in back scatter body-scanners at airports, like the TSA uses, but a new danger could be on the way for mobile phones and cellular towers soon – terahertz waves (THz). These waves have been shown to destroy DNA – the building block of life! Terahertz waves are part of the electromagnetic spectrum between microwaves and the infrared. Recently, a decision of The Ontario English Catholic Teacher’s Association has made the news: they want Wi-Fi banned in their 1,400-plus school classrooms in Ontario, Canada. They cite numerous studies that detail the health risks (see the articles, linked below for more). The union represents 45,000 teachers. Isn’t it time more schools – and people everywhere – say no to Wi-Fi? Check out The Gathering Offering show for Saturday, January 21, 2012 where they discuss ways to prevent “smart” meters from being installed in the first place. Find it at http://republicbroadcasting.org in the show Archives. You can sign up for a free trial membership to access the archives. Happy New year everyone! 2012 is a good year to get yourself educated about the dangers of RF/EMF pollution and protected! Today I visited with our dome designer and progress is being made on the prototype design! Soon, we’ll have pictures and video of our first portable dome! Domes are amazing structures, vibrationally harmonic, and able to be configured in almost limitless ways. We are planning to offer custom dome construction with built-in EMF/RF protection! You can use a dome to grow food in, for a workshop, for office space, gathering areas, recreation centers, for storage, or they make spacious homes that are earthquake-proof, high-wind resistant (200+ MPH winds and hurricanes/tornadoes won’t knock them down), and concrete domes are even fire-proof and will last for centuries! Check back soon for more news as our domes come together. Thank you to all our recent supporters! Have you tried a Quantum pendant? For a low price you can protect yourself and your loved ones – a wise investment in health! We love our Quantum pendants and wear them all the time! We can feel the difference they make, and have even tested their effectiveness – see our electro-dermal screening videos for full test results. It sounds like they are pretty dumb meters if they are giving off RF radiation ALL THE TIME, so what can be done about Smart Meters? Short of stopping them going on your home, there are a few things you can try. The problem is that even if you don’t have one on your wall, other dwellings around you may have them, and they “talk” to each other and to “cell phone towers” on a constant basis, so you are probably exposed to their RF as well. What can you do to protect from this radiation? Wear a Quantum pendant in the house and to bed, also put some pendants around your house/sleeping area. Quantum EMF/RF protective pendants worn on the body are an economical solution (see our videos). We list pendants here on our site. Put a Quantum pendant near the Smart Meter. If you can afford it, then shield your house with EMF/RF blocking paint, curtains, and fabrics. We can help you source these materials. Sacred geometry patterns have proven effective against EMF/RF radiation (see our electro-dermal screening videos). http://freeshield.com is where you can get one of the patterns we tested for free. We also used the Flower of Life pattern, which can also be found free online. Regular tin-foil wrapped around a cell phone will block the signal and stop it from working. This could be applied to other sources of RF radiation, though we have not tested it. Cover the inside wall opposite the meter with a shielding material. Ground your bed, as the metal springs and frame are a collector of EMF/RF and “focus” it into your body as you lay there. Grounding can be accomplished a few different ways, and there are also products available for this purpose. It is believed that these protective technologies are culminate in their effects; more is better. This has been proven through some of our own testing, so we recommended using several shielding technologies at the same time for maximum protection.